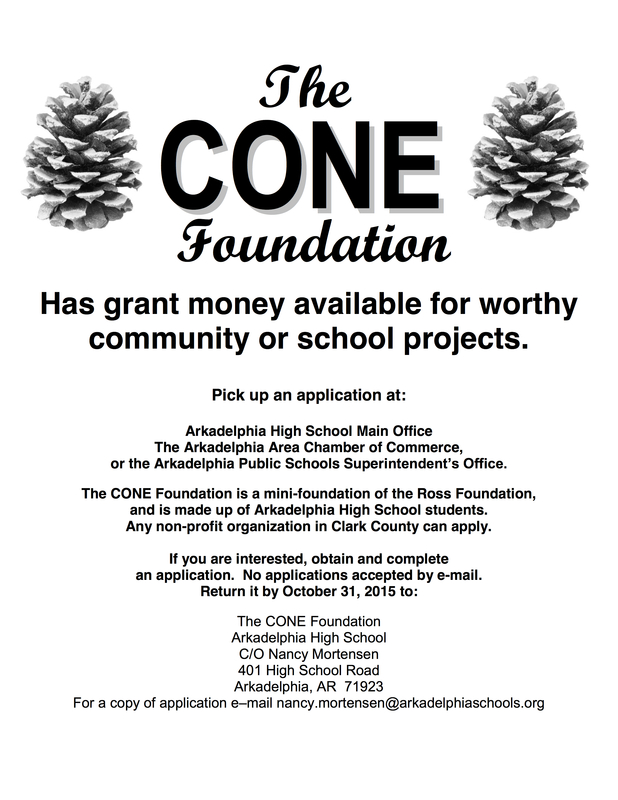 The CONE Foundation, operated by the senior Gifted and Talented class at Arkadelphia High School, has applications available for grants to any interested non-profit organizations in Clark County. You may pick up a copy of the application in your school office. Grant applications are also available at the Arkadelphia Chamber of Commerce and the Arkadelphia Public Schools Superintendent’s Office. Deadline for submitting the application is October 31, 2015. Please send (No email applications) applications to: The CONE Foundation c/o Nancy Mortensen at Arkadelphia High School, 401 High School Road, Arkadelphia, Arkansas, 71923. Thanks for your past and future support of CONE and giving us the opportunity to learn and serve the community.